Why Do Companies Advertise for Facebook and Twitter on Websites and Commercials? Why does Old Navy promote Facebook and Twitter on TV commercials? If you watch TV you’ve probably seen social media icons. For the last few years companies have been promoting their social media profiles in various places. You see icons on TV commercials, print advertising and on company websites. It’s an interesting thing and I thought it would be worthwhile to look at the benefit this practice has for companies. The Old Navy example above is just one of the ways companies are using other channels to promote social media. It’s confusing to me in a way because when someone is watching your commercial or TV show or movie or if they’re on your website you already have their attention. I’m of the opinion that the goal of social media is to get the people on those channels to your properties. You want someone that’s on Twitter to come back to your website or to go to your retail store. It’s almost like free advertising for Facebook and Twitter if you share their logos. Think about it…these companies are paying for TV advertising and they’re promoting Twitter and Facebook. Like the Old Navy commercial above, they’re only showing the logo. They aren’t even sharing their company URL that goes directly to their social profile or page. I mean, Facebook and Twitter have to love it. They’re getting all this exposure for free. It grows their userbase and they don’t even have to do anything. That’s my thought, but there must be some reason for it. These companies have really smart people working for them so there has to be a reason. My first guess for the reason companies promote their social profiles is to really grow their follower counts. They want to impress people with huge follower count and there is merit in this approach. I don’t really think people put social proof as their top purchasing decision point, but it can have a small impact. If you have a great product or service people don’t care how many Facebook likes you have, but if someone was referred to your company they might look to see if others have used your product or service. Part of that is seeing how many people follow you or like you. My hunch is this is the biggest reason companies are promoting social media with icons. You want people to go on their channels, follow you and tell their friends because you’re not after the people that already follow your company or purchase from your company. You’re after their friends and one way to get to them is through social media. If you’re going to do this make sure it’s worth it because you’re sending traffic away from your own channels – like your website – to social media sites. It’s a long-term strategy it would seem because you want more people to know about your brand. Finally, I think companies are looking for the big break in viral explosion. They’re promoting hashtags and profiles because they want to trend on Twitter. They want to explode on YouTube. This is more about doing something crazy or newsworthy and getting people to really talk about it on social media. It’s about exposure for the brand. But I think this happens regardless of promoting a hashtag. If you do something crazy and shocking on TV or somewhere else you’re going to have people talking about you on social media. I’m not sure that you have to promote the hashtag. People will create their own hashtags. I like what JCP did here. They’re promoting their own property. Here is an alternative to promoting social channels. 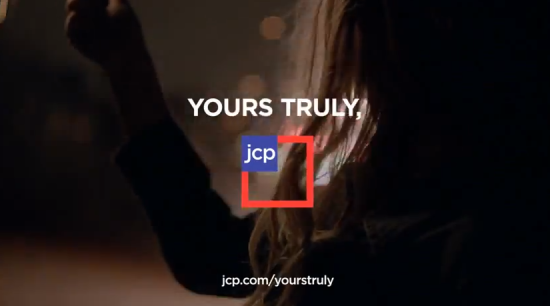 I like what JCP did here with a unique URL. It goes to a landing page on the company website. They’re paying for access to an audience and they’re pointing people to a channel they own. They’re not paying for access to an audience only to send those people to another audience they don’t own. This strategy is nothing new. Maybe ten years ago or so companies would do this on TV commercials and in print. They would show their URL. That’s where people that maybe hadn’t heard of the brands could go and find out more. That was before the days of social media. So this is a good alternative to showcasing your social icons. It’s interesting to see how brands showcase social media icons. We’ve touched on how brands use it in TV commercials and recently I’ve even been thinking about how we should be showcasing social media icons on our own websites. I look at one of the most successful brands in the world, Apple, and I don’t see them focusing on social media icons. They focus on products and their own channels. They rely heavily on TV to access audiences, but from there they push people to their website. There are no social icons on the Apple website. You don’t see social icons on GBW. We don’t have a Facebook page or Twitter account. I have my own personal account, but we focus on blogging and email subscribers.